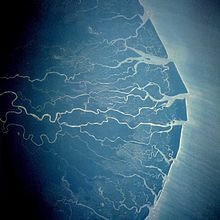 The Niger Delta is the delta of the Niger River. 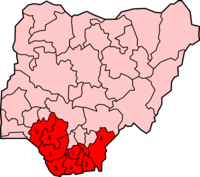 It is an area where many people live in Nigeria. Nigeria has become Africa's biggest producer of petroleum, and there are many oil wells in the Niger Delta. The natural gas from the oil wells is all burnt, causing environmental problems. Because of the money from petroleum production, there have been many political problems in recent times. For example, many oil workers have been taken as hostages. This page was last changed on 2 December 2016, at 23:36.